앤티가 - 앤티가에 있는 호스텔. 앤티가의 지도, 앤티가에 위치한 호스텔 사진 및 후기 정보. 앤티가에 호스텔, 저렴한 호텔, 아파트, 게스트 하우스, B & B를 찾고 계십니까? 앤티가의 모든 최고의 가격은 kr.Dorms.com안에 있습니다. 매달 수천명의 여행자들이 이곳에서 예약을 진행하시듯이 고객님도 앤티가의 저렴한 가격에의 호스텔을 안전하게 예약하실 수 있습니다. 웹사이트에 고객님이 원하시는 핫 트렌디 시내 주변의 호스텔을 쉽게 찾을 수 있으며, 대학가, 기차역, 공항, 모든 앤티가의 관광명소에서 가까운 호스텔을 찾을 수 있습니다. Lovely breakfast and they serve healthy smoothies. The staff has been an incredible help with planning my trip and adventures. The beds are equipped with curtains for privacy, outlets for charging and huge lockers. Not a party hostel but still you get to meet a lot of people. Centrally located so no problem with getting around. The hostel is really really nice. Sturdy beds, comfortable mattresses, spacious rooms, staff making sure that the place is spotless 24/7. Breakfast was nice, there's a bar and restaurant with reasonable prices. Good street location with lots of going on. The hostel has a cinema room, chill room, and a nice kitchen for guests to use. The staff are beyond helpful and friendly. The shower rooms are spacious and with working hot showers. The location is the best. You go outside and you are in the center of the town. Lots of restaurants, bars and places to see. I highly recommend this place. 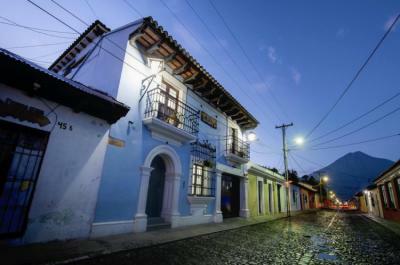 Strategically located in an old historic building in Antigua and close to the main square. Spacious rooms with usb charging ports. 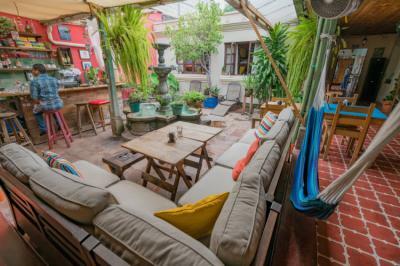 The hammocks, couches, cushions and floating bed out on the lawn were really comfortable.The hostel has ongoing activities for guests.